SOUTH CHARLESTON, W.Va. — Youth hunters in West Virginia will get a chance to squirrel hunt during the one-day season on Saturday, Sept. 2, 2017. The statewide squirrel season will open Sept. 9. The Sept. 2 youth-only squirrel season is designed to introduce newcomers to the sport and allow older hunters to enjoy a day mentoring the next generation of hunters. 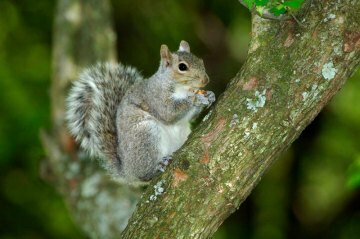 “Wipe the dust off your favorite squirrel gun and hit the woods this fall in pursuit of the Mountain State’s most abundant small game,” said Paul Johansen, chief of the Wildlife Resources Section of the West Virginia Division of Natural Resources. Hunters should expect to see lower squirrel numbers this year compared to last year, due to a slightly below-average hard mast crop in 2016. Squirrel survival and productivity will be reduced following a year of poor mast conditions. “Squirrel hunters should remember success comes with proper scouting and locating areas that have an abundant mast crop,” Johansen said. The daily bag limit is six, and the possession limit is 24 squirrels. Youth hunters under the age of 15 must be accompanied by a licensed adult. The accompanying adult cannot carry a gun or a bow and must remain close enough to the youth to render advice and assistance. Youth hunters age 15 to 17 must comply with all licensing requirements. All other licensing requirements will remain in effect, and hunters should check the 2017-2018 Hunting and Trapping Regulations Summary for additional information.